This week was the final session of IntAct Social. Over the last four weeks we’ve chatted about doing social media on purpose. It’s been so much fun, and I’m looking forward to watching improvement from those that participated. The first step in getting your social media in order is defining your brand. When your brand is consistent, your customers get the same YOU no matter where they’re interacting with you. They’ll get the same version of you on Instagram, in their email inbox, and in person. If you’re not sure how to translate the in-person version of you to your digital presence, try this handy trick: Grab your phone and use voice-to-text as you TALK into your phone. Don’t type, just talk. You’ll notice words and phrases that come up often that you can integrate into your digital presence. You’ll notice terms you use, and terms you avoid. Use this same voice in your digital copy to help keep your digital world on brand. The second step in doing social media on purpose is to define your customer. And I’m not just talking about why they’re YOUR perfect client – I want you to know everything about them. Why? Because you can get inside their head this way. When you understand your business and when you understand your client, you can build a bridge between the two. That bridge becomes priceless understanding for effective marketing. 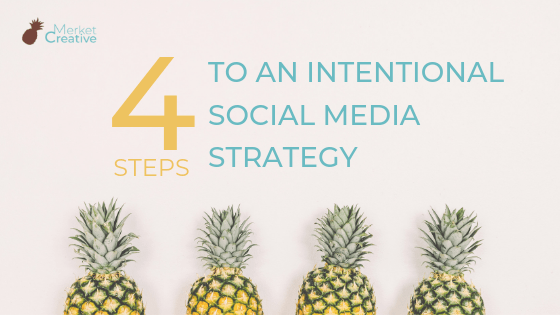 The third step of creating social media with intention is the hardest step. It’s time to take a good, hard look at what is actually happening with your social media based on what you learned in steps one and two. Are your social posts on brand? Are you speaking to your ideal customer? Are you consistently showing up in the way you said you would? This step can be very discouraging if you’re not careful, so be sure to show up with gratitude for what you’ve learned to this point. Here’s my favorite tip: I do this in the morning, after a good breakfast and a good workout. I make sure I have my favorite music playing and I’m in a good headspace. Additionally, when I analyze my social, I make sure to have my one-page brand plan handy so I can easily determine what’s on brand and what isn’t! Who you are, and why you do what you do. Who your customer is, and what they’re thinking. What’s worked well in the past, and where you have room for improvement. How often are you going to post? How are you going to engage with your customers? How will you educate them? How will you bring entertainment? What’s on brand for you? Where can you take a moment to breathe, and where do you need to focus your efforts? Not sure where to get started with your social media plan? Here’s my best tip: Blog. Make a list of 3-4 general categories. Then write out every possible blog topic you can think of for each category. Then write those posts. Aim for 1 a week. Use those blog posts as the base of your social strategy. ©2019 Merket Creative | Site designed by us.